Of our dear Savior's birth. The closing paragraph from our 2014 edition of the newsletter bears repeating again. "This Christmas, as we remember the children at Lifeline and the many Haitian people who have so tenderly shared their culture with us, let us sing with the joy of our most precious gift, the gift we have all received by grace, the Lord Jesus Christ. Our Christmas celebrations, whether unembellished or elaborate, are dim reflections of the gift He has lavished upon all of us--his great love. With genuine and abiding joy, we can declare with our Haitian brothers and sisters that it truly is a Merry Christmas. Jwaye Nwèl!" Two teams travelled to Lifeline during the last week of October and first week of November. They provided medical care, furthered the preparation for the Oasis Project, and took part in the annual Pastor's Conference at Bethel Church. Over the two weeks this fall, we did eight days of clinic. 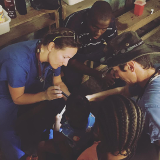 This included one day seeing Lifeline children and staff, two days in a mobile clinic in village communities that had been affected by the hurricane, and five days seeing community members and pastors who had traveled in for the pastor's conference at Bethel Church. Combined, we saw 915 people in two weeks! One of our mobile clinics was just 30 minutes away from Lifeline while we set up another clinic about 2 hours away at the base of a mountain. This clinic wasn't for the village we set up in but for those who traveled down the mountain to be seen. Those who traveled in for the mobile clinics had harrowing stories about the hurricane. One of the saddest was a sweet lady describing flood waters that came into her house and up to her chest. She lived with her sister who was swept away. This year more than any other, those who traveled in for the pastor's conference and those treated at the mobile clinics were very sick. There were more infections, more instances of cholera, and injuries from the hurricane. Everyone talked about losing crops. We are grateful that Lifeline and the surrounding area was spared from heavy winds and damage and that we were able to serve in regions where people were in greater need. On October 26th Sara Vincent, Angela Grindal, and I saw twenty young adults that have either aged out or will soon age out of Centre Children International Lifeline d’Haiti. On the porch of the guesthouse, they spent hours working with each other and Judney Joseph to fill out applications for admission into the Oasis Project program. They made the first small steps toward their future, toward empowering themselves, expanding their education, and living wholehearted lives in Haiti. After their applications were completed and looked over, Angela, Sara, Judney and I sat down with every one of the applicants and interviewed them. Along with explaining our current program structure, we asked them questions about their relationship with Christ, their “big kid” dreams, and we helped them find room for improvement in their current academic career. The amount of potential and drive each of them has proves and affirms our motivation that we are going in the right direction. Regardless of their current circumstances, they have not waivered in their love for the Lord, and their belief that He will provide for them, and that He loves them. We pray that Oasis can become a pathway for God’s ongoing provision and direction for each one of them. Many have wondered how the pastors and congregations of Haiti that are sponsored through One Body faired through Hurricane Matthew. On our recent trip to Haiti to take part in the Pastors Conference we had an opportunity to ask this. What we heard was heart-breaking in one sense and encouraging in another. First the heartbreak: the churches that One Body has built are all still standing, while the “shifting sand" (and dirt) around them is not. These pastors, many of whom are farmers, had their crops wiped out from floodwaters, homes damaged from winds, and any resources they had have been diminished. When the pastors and their families were seen at the clinic we noticed a definite difference in their health from a year ago. Many of them were sick. We even saw a case of typhoid and cholera, which, thankfully we had medicine to treat. If you have been to Haiti you know the conditions in good times are desperate but in bad times they are devastating. These are bad times. Now the encouragement: the Haitians that One Body and Haiti Lifeline work with are resilient, faith filled people who know how to come back from disaster time after time. Their faith and commitment to the people in their villages was seen through their intense attention to all that was shared with them at the conference. They are hungry to receive tools and resources that will help them be better Pastors and leaders in their communities, not just their churches. They are committed to Christ and they love His people. Our theme for the conference was "Discipleship". Pastor Craig Congden (of Grace Bible Church of Topeka, Kansas) did an excellent job emphasizing the importance of worship, Bible instruction, fellowship, service and evangelism in the discipleship process. Each of the four days consisted of main sessions and break out groups for the 125 or so pastors and their wives who attended. Each evening, the Lifeline children attended the evening sessions. At the end of the week, we were blessed with special music, including the Hallelujah Chorus performed by the youth of Bethel Church. These Pastors are more equipped now to be part of the One Body emphasis of "Disciple, Build, and Fund". When American churches join Haitian churches in the future this will be the discipleship piece by which they can mutually encourage one another. Three pastors, whose communities are next in line to have churches built in them through the One Body effort, were interviewed. It quickly became evident that building these three new churches will be no “walk in the park”! Transportation is always an issue in Haiti and will be with these new churches. The language barrier is challenging but not impossible. It is the outcome that will motivate the equally resilient American partners to fund, travel, build and encourage these wonderful communities! What an absolute joy it is to see these congregations worshipping, and being built up in their most precious faith in sturdy new buildings, often the most significant building in their community! These three pastors are as ready as they can be to help get these churches built. We are looking for American churches, small groups, or individuals who are willing to take on the challenge and partner with One Body to bless a Haitian community. Whether it is raising the money for the building, raising the building, or raising the believers in those churches through encouragement, One Body and Haiti need you! It is a very difficult, but rewarding effort, and one that we have seen God bless time after time after time! 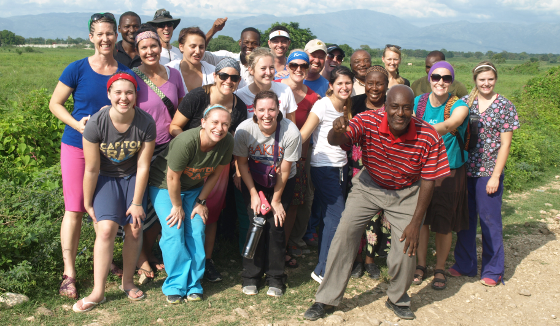 Editor’s Note: Finding folks who have the time and desire to put together a reflection of their trips to Haiti has proven to be a hit-or miss proposition. Let’s face it. The difficulites of Haiti can tear you wide open and being able to put jumbled thoughts and mixed-up emotions to a page can be daunting. Most of this year, we have foregone publishing any longer, personal reflections as no one has taken up the call. But, for our last edition of the year, we had two respond. And, interestingly, though they don’t know each other and with no prompting, their thoughts tell a diverse, yet similar theme. My worldview has been wrecked. Fractured. Blown apart. No longer can I see beauty and take pleasure in beauty for itself, but instead it has a new backdrop. Now everything I see, every emotion I feel, every joy I experience is seen through a lens cracked by my experience in Haiti. I grieve for the ones whose lives I touched while in Haiti. I had never come face to face before with the reality of the hardship the materially poor face. Tears come and go. Life occasionally seems normal, and then I am tipped back into grief by a word, a comment, a news item, that brings back a torrent of memories--of silken faces, penetrating deep brown eyes, pain and disease with no immediate remedy. A developing world once so far away, has now been brought up close. The clinic week at Lifeline seeing pregnant moms and babies began with my daughter by my side as assistant. Her comfort with the Haitian people calmed my apprehensions. In clinic, she delighted our patients speaking to them in her nascent Creole. Both of us, however, were very grateful for our Haitian interpreter, who received a crash course in midwifery medicine. Our first patient of the day, a beautiful but crippled woman, haltingly made her way into the room. Her name was Mary. Dressed in her very best clothes, her story awkwardly tumbled out. She said she was thirty-seven, but who knows for sure in a country where many don’t even know their real age. Her first baby had died at five weeks of age after being delivered by her untrained mother. She had no money for a skilled attendant, much less a hospital. Now she was in late pregnancy with a baby conceived after an intruder’s assault. She said she was crippled and because an angry relative had put a Voodoo curse on her. With my daughter’s words in my mind, I took Mary’s precious face into my hands, assuring her that this baby was her baby and that God loved her. We confirmed by ultrasound that her baby was lying breech. I wondered if her twisted body could birth a breech. Groping for a plan, I invited her to come back to the clinic if she were to labor during that week. I didn’t know what else to offer her. I didn’t know if it was even ok for me to make such an offer. But what was she to do? How else could I help her? However, we knew the reality of Mary actually making the long trip back to us in labor was remote. So my daughter and I gave her mother a crash course, through our interpreter, in basic breech delivery techniques. We prayed together for her, for a safe delivery, a healthy baby, and for provision for their needs. And then Mary, her unborn baby, and her mother left, on their way to a home they said was an hour away. Perhaps their home was made of cement blocks, or more probably of cardboard with a tin roof. Most likely it was as much as a mile or more from a source of water--clean or not. I wondered by what means Mary and her mother even sustained themselves. Mary did not return to the clinic that week. I’ve carried a burden for her salvation, for her and her baby’s life, for an uncomplicated delivery, for food, for clean water. I am still not fully reconciled to never knowing what became of Mary and her breech baby. The next patient came on the heels of Mary’s departure. She was a mother of three carrying her fourth baby, with maybe two months to go in her pregnancy. She presented with very high blood pressure and clinical signs of a severe pregnancy complication. In the United States, I would have taken such a woman directly to the hospital. But she had no money to pay a doctor, much less the hospital. After a few more brief clinic visits that flew by in a fog, I fled back to our room, collapsed on my bunk and wept, overcome by it all. I managed to pull myself together to eventually return to the clinic, dispensing vitamins, antacids, de-wormers, fungicides, antibiotics. I saw women and children with disease and want that I would never see as a midwife in America. So I aimed to ‘just love them”. I asked permission to touch them. I asked them to look at me. 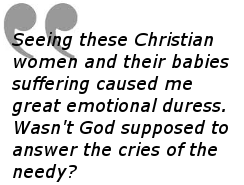 I told them they were beautiful, and that God loved them. I purposed to show them respect, to ask them permission before treating them, to touch them with tenderness, to lift their lovely faces up to look into my eyes, to respond with joy when they returned my smile. A few of the moms and their babies we saw were the wives and children of Christian pastors attending the pastors’ conference. I asked if I could take a break from the clinic and attend a women’s session at the pastors’ conference. There a woman with a fist-size thyroid tumor asked me to take her picture and pray for her. She’d been seen in clinic, but her tumor was beyond the scope of our care. I felt utter helplessness as I prayed for her healing. Indeed, I should have asked her to pray for me. My worldview has been wrecked, now devastated. The Lord has taken a wrecking ball to this flawed edifice. My worldview was truncated and only encompassed our western-Church comforts. I am grateful that in his mercy He is beginning to re-make it into a more full-orbed biblical perspective. The pressure now weighs profoundly on my soul. I will never be the same. The statement kept whispering over me as we flew to the tropical nation so recently and repeatedly ravaged by disaster. How did I feel heading to Haiti that day? I expected God to reveal truth about who He was… in Haiti, and at home. When we deplaned the air was fresh with the scent of rain, the inky wet night masking the face of Haiti. We drove to Lifeline, slowly absorbing the raucous traffic, breathing in the smell and taste of fried plantains bought from a street vendor winding his way through blaring horns and grinding gears while a modernly dressed woman relieved herself in the midst of a busy intersection. All around me the night embodied what I had imagined – but where would I see the Lord in this place? I saw Him in the Lifeline children who ran barefoot across the sandy courtyard to the stifling hot warehouse where they voluntarily joined in the portioning of rations for those affected by Hurricane Matthew. They smiled and laughed as we worked, never asking for as much as a precious handful of rice for themselves. I saw Him in Nicole and Daniel, opening the gates of Lifeline for community access to the medical clinic, and as they judiciously portioned food for those who needed it most. And then again as those same Haitians willingly divided their meager rations among many, many more. I saw Him in my teammates, who have faithfully returned to Haiti to love children they’ll never get to bring to America. I saw Him in the way they demonstrate how the most important parts of fatherhood and family aren’t about where you live but whose love defines you. I saw Him when I came home from a day at the beach with the younger Lifeline children when my friend, fifteen- year-old Tima, greeted me exuberantly with the gift of a handmade bracelet with my name woven between the threads. Though my name is spelled out clearly , when I wear it, all I read is “grace”. Because it was grace that I received – a precious gift and labor of love not earned but freely given from one with nothing but love and grace to give. It isn’t the poverty of Haiti that wrecks you. It isn’t the smells. It isn’t the sites. It isn’t the heat. 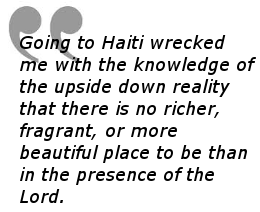 Going to Haiti wrecked me with the knowledge of the upside down reality that there is no richer, fragrant, or more beautiful place to be than in the presence of the Lord. In His presence, every incongruent expectation is reconciled. In His presence, we can hold with one hand the truth that the world, and each of us in it, is full of more despair than we thought possible, and that His hope is stronger still. His faithfulness is so complete that he has to empty us completely so that we can receive all He has to give. Truly, there are no orphans in the kingdom of God – just children around the globe with the face of our Good and Beautiful Father, who will someday bring us home. I return as I went. The Denton Shipment has made it to South Carolina. Pray for quick delivery. A building team will follow the shipment. Pray for direction for timing and logistics for the team. Provision for the general budget. Relationships between believers connected through One Body. Further establishment of the Oasis Project. Progress for ongoing Lifeline adoptions. Many are stalled without explanation. Continuing recovery for those affected by Hurricane Matthew. 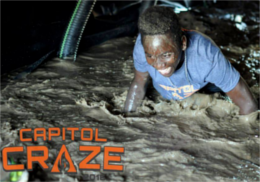 On September 10th, Haiti Lifeline hosted its fifth and final Capitol Craze 5K Mud and Obstacle Run. Participants came from all over to enjoy the beautiful weather and the challenging terrain of St. Francis River Hill. Course director Noah Vincent and his crew went all-out adding new obstacles and rerouting the course to offer runners great views of the city and fresh chances to get muddy. Thanks to a generous donation from an anonymous donor, all costs associated with the race were covered before planning ever began. This means that all sponsor and participant dollars went directly to the children and families served by Haiti Lifeline. Proceeds were directed toward the general fund, the scholarship fund, One Body, and the Oasis Project. We want to thank all of our sponsors, participants, and volunteers. Without all of you, this event would not be possible. We are so grateful for the support of so many over the past five years. This event will always be remembered fondly and we look forward to seeing what the Lord has planned for future fundraising efforts! Now is the time to consider making that last minute, year-end donation. Tax benefits aside, the need is great and the goals are greater. The work of Lifeline encompasses many areas that impact health, education, the greater community and churches. We trust God for his his provision in each of these areas. Please continue to spread the word about Lifeline and the work that is being done there. The General Fund- this provides for most of the general operations and monthly budget that provides the basic needs of the children. It has been slowly tapering over the last few months. Donations can be made on a one time or as a monthly sponsorship. Click here for more information. The Oasis Project – We are starting to push for funds for a property and building to house this program. Nicole is excited about it and has given her full blessing. In addition to raising money for the facilities, educational sponsorships are needed for each child. Currently, until we have a property, sponsorship costs per student will be $100 a month to provide education, help with housing and a food stipend. Find updates on the Oasis Facebook page. One Body Project – The board has approved building a well or cistern at every church we partner with. These will cost between $3,000-$5,000 each depending on the site, but would make for a nice year-end donation. The Lifeline Library - The library is supported through a separate fund which pays for the operating expenses and keeps the doors open to the children. We are looking for school groups, individuals, or organizations who would like to sponsor the library for a week, a month, or a year and "Share literacy, learning, and love with the children of Haiti Lifeline". You can make donations online here. You can find our past newsletters on the HaitiLifeline news feed or in Mailchimp's archives. Copyright © 2016 Haiti Lifeline Ministries, All rights reserved.